I have an Olympus CX41, which I'm going to hook up to a Sony A7ii, as well as some other cameras laying around at my lab. So I'm looking for an adapter. There are quite a few options available online, and I was wondering if I could get some opinions on what would be the best choice for me. At the moment my needs are only aesthetical in nature, no measurements intended. But since I´m teaching physics here in the University of Reykjavik, then it might be a nice extra feature if the adapter was suitable for doing measurements. I assume the uniformity of the brightness over the image plane has to be consistent, and a flat field giving good focus over the whole picture would be nice things to have. Here below I've listed the adapters that I've found so far. Would be great to get your opinions. At the moment I have no idea how to evaluate if the cheapest one is more than good enough, or if I should opt for a more expensive one. I might maybe add that at the moment I'm mostly aiming at shooting snowflakes, insects and various crystals. Something around 10x magnification, but would like to have other options available. The one from Telescope Adapters looks promising, but I'm a bit worried that the versatility of the adapter might actually make it worse since it's not specifically aimed for this microscope and has the zoom functionality that might degrade optical image quality. - Not affected by vignetting, chromatic aberrations (colour fringing) or barrel-shaped distortions. - Anti-reflex system that prevents glare, reflections and hot spots. Which trinocular tube do you have for your CX41? A picture would be helpful. I don't have this exact microscope but from what I can see online this microscope has the same camera port as the BX and SZX models (someone correct me if I'm wrong). This would mean that the microscope generates a fully corrected intermediate image 104 mm above the dovetail fitting of the camera tube. All you have to do is to place the sensor of your camera in the plane of the intermediate image and you get an image at 1x magnification. You could even have them made in a local workshop. If you want to use a full frame sensor, you need to include a teleconverter (1.6x). The full frame adapters in the links are nothing but such teleconverters. All this is likely to be cheaper than the $600+ quoted. Before you start, you should try to locate the position of the intermediate image on your microscope (sheet of paper in a dark room). It should be at 104 mm. You right! There is indeed a nice image circle at exactly 104mm from the adapter. Seems to be relatively aberration free. But I think we're still going for an adapter, just to have the flexibility to use any camera we have lying around. Any thoughts on these adapters, will the cheapest one be quite adequate or will I benefit something for going for the more expensive ones? You can probably find a U-SPT, a PE 2.5x photo eyepiece and a Photomicro Adapter L on eBay for around £100 or $100 each. Then you just need an adapter for using Olympus OM lenses on your camera. You can probably find a U-SPT, a PE 2.5x photo eyepieces and a Photomicro Adapter L on eBay for around £100 or $100 each. I completely agree with the above. No need to go with third-party adapters when the original Olympus ones are very likely better and almost always cheaper. The only uncertainty is whether the CX series uses the same photo eyepiece adapters as the BX and AX series. I have no experience with CX scopes. I have a CX41 System Diagram showing a U-SPT above a U-CTR30-2 trinocular head, so the all-Olympus solution should work. One difference between the CX and the BX scopes is that the cental opening in the dovetail is smaller in CX. I don't know if this will be relevant for example in terms of vignetting when projecting to larger sensors. The CX tubes and oculars have a FN of 20 but the scope works well with the BX FN22 tubes. I can try with an SWHK FN 26.5 by tomorrow if this is helpful. U-SWTR-2 trinocular head: 28.8 mm. U-PHOTO head for the AX series: 32.0 mm. U-TR30 trinocular head (for 22 mm eyepiece field diameter): 26.8 mm. U-TLU stand-alone tube lens: 26.8 mm. There is likely a good reason for the relatively high diameter of these tube lenses. 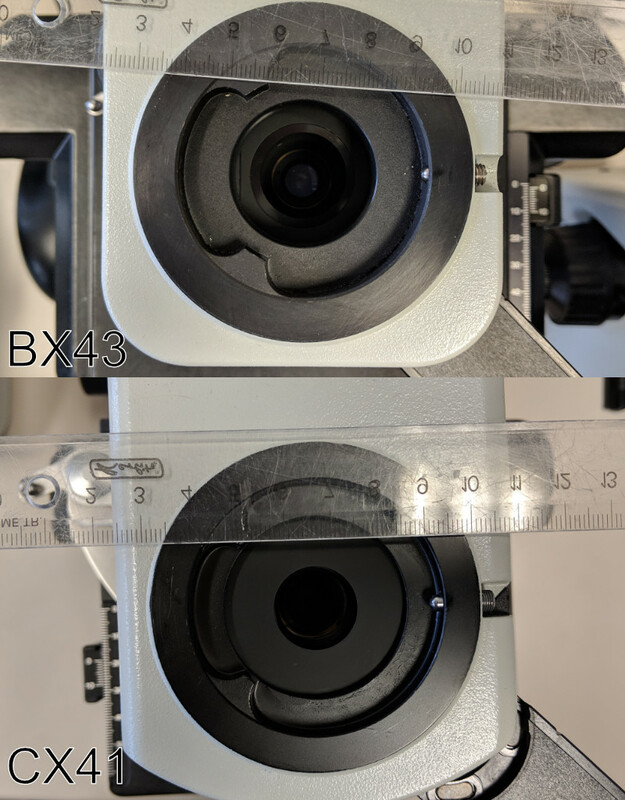 Even if a narrow aperture does not cause a visible vignetting, it might have other adverse effects in the periphery of the image circle, perhaps especially with high-NA objectives and/or objectives with large rear exit pupils. However, the same limitation is likely true of the CX scope when used with its original trinocular head. Perhaps there is no vignetting or peripheral image degradation with a sensor that fits within the specified 20 mm image circle. A Micro 4/3 or larger sensor used for direct projection from the tube lens, or eyepieces with a larger field stop than 20 mm, would likely be affected in the periphery. But since I´m teaching physics here in the University of Reykjavik, then it might be a nice extra feature if the adapter was suitable for doing measurements. Almost any microscope is useful to perform measurements. What you need is to calibrate it with a micrometer slide. Visually you can do it with a micrometer disc at the eyepiece or with a dedicated filar micrometer eyepiece. - at a standard image processing software like Photoshop you can superimpose the image of the micrometer slide with the image of the subject, both taken with the same objective, camera, adapter and image size, of course. I just swapped the superwide tube (SWHK) to the CX41 (what a strange sight) and it delivered a nice and even picture on a Plan 40x (!). So I do not think that the impact of the small dovetail airspace is very large. It might well depend on your preferences and whether or not you aim to push everything to the maximum. Glad to hear that, I almost spent $1600 on the LM scope adapter, but if this works just as well, then I'll definitely give it a try. This is the Photomicro L adapter, the U-SPT adapter and PE 2.5X 125 eyepiece. I'll then just buy OM adapters for my cameras. Should that cover what I need? Yes, that does it for a full-frame Sony Alpha like yours. ...however, one can always improve. As you will notice, this setup mounts the camera at the top of a remarkably long photo tube + adapter, so getting to view the LCD screen of the camera will require you to crane up your neck (especially with a tilt-only LCD screen). I don't remember whether your A7 II supports live view on an external HD monitor. If it does, then a not-too-large computer monitor mounted at a proper height and distance will be a significant improvement. I use an HP V214A, which is a 20.7" ordinary computer monitor with HD input connector, so a simple cable connects it to my Sony A7R II. These days it can be found quite cheap. It beats the small camera LCD screen and its limited amount of tilt hands down. Add a cheap third-party IR remote control to get access to most of the camera functions (including the shutter button) from your tabletop. The A7II should support live view with capture one pro. I think there is a pro sony version at a reduced price. The for-sony free version does not support live view AFAIK. Please share your experiences. This might be a way I would like to take in the future.